So… yesterday I set to doing a wee craft with Cashel (Camper will add his touches to them tomorrow). Again inspired by something Emily did last year with my nephew. The super colorful collage is just leaves we gathered (we’ve been working on learning our colors – Cashel has most his main colors down, much to my surprise, so now we are expanding to a few new ones that are more descriptive. This was a fun way to do that!) and they were adhered with rubber cement. Em, I may even still have YOUR bottle of rubber cement from last year – need to get that back to you. Ha! The other one was just paint on his hand (we’ll add Camper’s hand soon) to represent a leaf falling down. All I needed was a fall paint color, some card stock and a felt pen. I did end up using some fun stamps for the “FALL” just to make it pop, but you could do that by hand too. SO easy. We try to use lots of handprints as they are so simple, bring out the giggles with the tickling of the hands when paint gets brushed on, and are such a fun representation of our kids at THIS particular size and age. I’m in love. I think I may use a different paint color (maybe red or orange) and cut out Camper’s hand print to paste on – kind of a 3-D falling effect. But we’ll see! And secondly I want to encourage you that creating wee treats for friends can be so simple, make your heart glad, and let them know just how special they are to you. I was going to make a batch of delicious vanilla spiced chai powder, that I mix with milk. So I decided “why not make extra to share!” This recipe is inspired by my sister Tonie. She LOVES a particular brand of powdered chai so for two years now I’ve been working on perfecting a homemade, less expensive, option that she approves of. I’m still perfecting but do love it this way! This time all I did was make a batch and a half. The first batch I put into clear bags (I keep these on hand just from the dollar store… for all kinds of wee treats or fun packages.) 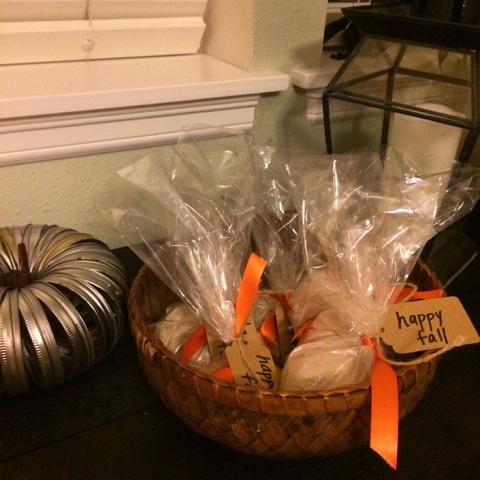 Then I added a “happy fall” tag with instructions on the back. Festive ribbon and twine and voila. A few friends got an “I’m thinking of you treat” and aside from acquiring the ingredients it only took like 15 minutes to do! I love simple and sweet ways to express love – especially in Fall! The half batch I kept for me in my jar – this is often my afternoon treat! (I’ve tried it with 1/4 tsp white pepper too but often choose to leave it out – just depends on how “spicy” you like it). I just toss it all in to my Cuisinart and blend, then mix with a spoon, and blend some more. Repeat until fully mixed. You can do this in batches in a blender too but they are smaller so I suggest a half batch or doing it in chunks and then mixing in a large bowl. Hope you are inspired. Each of these didn’t take more then 20 minutes to put together – so worth it if you ask me!